Beswick Ware. Coffee Pot & Tea Pot with Lids. Coffee Pot H7 x W5 Marked 2229. may have been used previously. BACKSTAMP - BESWICK MADE IN ENGLAND - 2229. 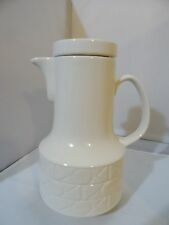 WATER JUG OR SMALL COFFEE POT. GOOD CONDITION. As we now have over 1200 pieces to complete your sets. Zorba 2229. Beswick Pottery. One and a half pint capacity. 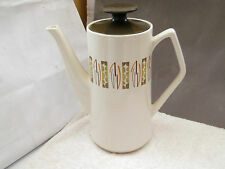 This coffee pot was made by Beswick as design 2211. It is in very good condition and stands approx 8.75"/22cm high. It has Beswick, England 2211 impressed into the base. A trio of Beswick ware. Consisting of a coffee pot, a tea pot and a milk jug. All in good condition for their age. Beswick, Floral Chintz design, Coffee Pot REDUCED! Beswick, Floral Chintz design, Coffee Pot., a different design on either side. You are Buying: 1 x Coffee Pot, stands approx 9.5" high. 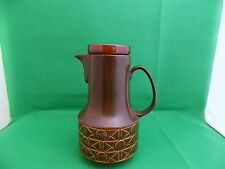 RETRO BESWICK DECORATIVE COFFEE POT IN LUNAR PATTERN DARK GREEN LID GREEN, BROWN AND ORANGE ABSTRACT PATTERN. POT IS CRAZED THERE IS A LARGE CHIP WHERE LID FITS AND COVERS THE CHIP LID HAS HAD A VERY LARGE CHIP TO RIM OF TOP PART THIS THEN BROKE INTO THREE ALL HAVE BEEN REGLUED QUITE WELL LIGHT BROWN SHOWS UNDERNEATH LID IS NOT CRAZED. 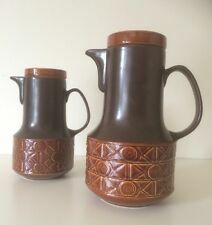 Beswick Appollo 1973 coffee jug. Lovely, tidy piece. Could complete your vintage tableware. You may wish to browse other items I have for sale including other tea/coffee pots,tableware, glassware, pottery, collectables etc etc. Most items are despatched within two days after payment is received (B4). 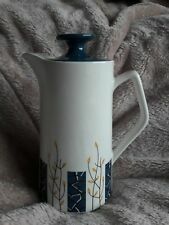 BESWICK APOLLO COFFEE POT. MARKED TO BOTTOM WITH BESWICK ENGLAND 1973. Height 9" (23cm). Olive Green Coffee Pot.